The costs of bandwidth across Asia, especially MPLS, can vary significantly across different countries, and many enterprises depend on a hybrid WAN strategy to achieve reach and keep costs down. 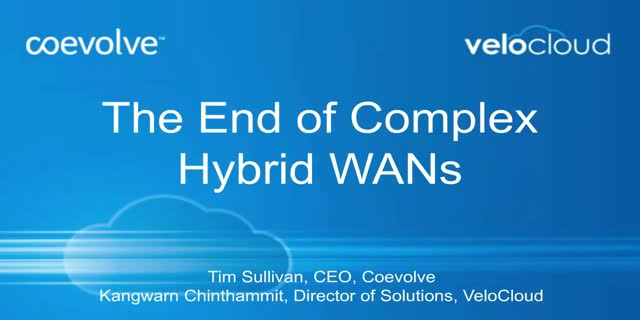 However, designing and deploying hybrid WAN architecture can be complex and require expensive resources to manage hundreds of lines of configurations. Software-defined WAN (SD-WAN) can transform existing hybrid networks into a dynamic, adaptive environment that uses all available bandwidth more effectively. In this webinar, our panel of networking experts will share real-world experiences and outline key approaches for getting more out of your existing network in Asia Pacific. We will share with you our perspectives based on numerous regional deployments on how SD-WAN has transformed many of our clients network to be adaptive, flexible & cloud-first IT asset.